..so they dance! : 70's week: Lost-and-found, maa ka pyaar and so forth. 70's week: Lost-and-found, maa ka pyaar and so forth. I'm going to take a bit of a different approach to 70's Week 2010. Instead of covering a bunch of different 70's films, I'll mostly be covering one - Parvarish directed by Manmohan Desai, released in 1977. Not because I think this is the 70's film and no other film is as important but because I rewatched this recently and it hit me this is everything a 70's film can be, and so much more. It's just really good, and yet it doesn't quite have the name a lot of 70's classics have made for themselves. So I'll be doing thematical posts of 70's masala traits that Parvarish ("Upbringing") has - to promote it among those who haven't seen it yet and to give those who have a chance to share their love. I mean I guess theoretically some of you might dislike this film or be 'blah' about it. But ..I can't imagine that anybody actually is. The posts WILL include spoilers. But you can skim and look at the pictures if you don't want to be spoiled! First up is the building block to most Manmohan Desai masalas; the lost-and-found family drama. Parvarish, like a lot of 70's films, starts from the backstory. A bandit Mangal Singh (Amjad Khan) finally gets nabbed by the police, specifically DSP Shamsher Singh (Shammi Kapoor) just as Mangal's wife has given birth to a baby boy. She asks the DSP to take the baby and make sure Mangal never gets his hands on that baby, so that the boy won't grow up to be a crook like his father. Shamsher Singh takes the baby home and adopts it, the boy Amit (Amitabh Bachchan) growing up alongside his own son Kishan (Vinod Khanna). Due to some confusion, Kishan mistakenly believes he is the son of Mangal, and thus grows up leading a double life as a crook unbeknownst to his family, while Amit becomes a police officer like his adoptive father Shamsher. Just typing that plot wore me out, as complexity of relations is inherent to these sorts of lost-and-found stories. The idea is always that a child gets separated from their parent(s), for better or worse, and later reunited. This is usually laid out up-front, but sometimes the plot twist is only delivered later (though the audience usually guesses it's coming). In Parvarish, it's never unclear that Amit is Mangal's son, but of course, his ignorance of the fact makes Kishan's double life all the more interesting. 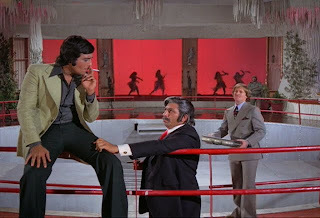 Even if we know the truth, it doesn't take much away from the viewing experience, because Parvarish, as most 70's masalas, is jam-packed with all the required masala ingredients. An awesome villain's lair, car chases, diamonds, songs, romance, comedy.. I think predictability is too often taken to mean bad script-writing, but I think with the case of the lost-and-found story trope, all it adds is anticipation for what's to come. With Parvarish, you want to see what happens when Amit finds out he's Mangal's son, and Kishan discovers he isn't. With Seeta Aur Geeta, you want the twins to meet. Another common 70's masala trope of "maa ka pyaar", that is, accentuated love of a mother, or a hero's love for his mother, is quite weak with Parvarish. Indrani Mukherjee (also the mother in another Desai classic, Dharam-Veer) plays the mother who loves both his sons but this love doesn't play a huge part in the story. The main tension is that between the two brothers, one devoted to serving the law and the other to breaking it. Kishan manages his double life with relative ease, even if there are many close calls to Amit finding out the biggest crimes are run by his very own brother. Whether upbringing decides a person's character, the film is very clear about. Kishan is a criminal, not because a criminal's blood runs in his veins, but because he is essentially brought up by Mangal Singh. Amit, believing Shamsher to be his father, grows up to believe in following the law. 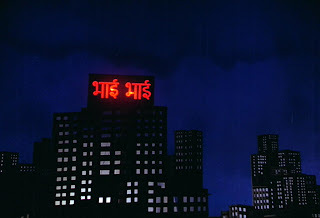 The awesome reveal of Kishan's double life happens at a hotel apparently named Bhai Bhai (brother brother) - or outside the hotel you have this blinking signs because Manmohan Desai is no euphenism for subtlety, but what about sisters? Our heroines Neetu Singh and Shabana Azmi share a very tender but goofy sibling relationship, and the fact there's quite a lot of them in the film seems quite rare based on my (limited) 70's film watching. The only other film with sisters in it I can think of is Seeta Aur Geeta, so it certainly feels awesome that this film has some. Go sisters! Tuesday's post will be about fashion and decorations, so see you then! GREAT IDEA!!! This is my favorite 70s film too and it pains me that people do not always fully understand its awesomeness. I've seen it 5 or 6 times and always find more and more Desai/masala layers and clues in it. The heroines are high on my list of why it's so great - they have a lot more character and action than women usually do. 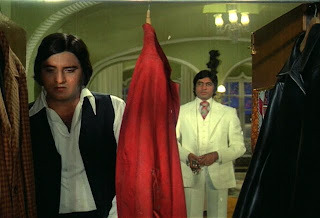 PS I'm just realizing that this is at least the third film I've seen pairing Shabana/Vinod - Chor Sipahee and Amar Akbar Anthony - but there are quite a few more, aren't there? I wonder if there are interviews with either of them talking about their frequent pairing. I'm beginning to think I didn't give this film the chance it deserved. I might have to queue it up on Netflix and watch it again this week! The joy! I'm loving your take on 70s week too! I cannot WAIT for the "fashion and decorations" post tomorrow! I'll be on pins and needles in anticipation! I actually haven't seen this one so I can't comment... but I will be skimming the pictures! Anything that comes packaged with Vinod and Neetu is a sure-fire hit, as far as I am concerned. Add in two pick-pocket sisters who outwit the heroes, and its the best film ever! :-) I havent seen this film in more than a decade. Maybe 70s week is the right time to do it! Looking forward to all your Parvarish-love. Beth - If you are curious, you can look up my review for Shaque, a film me and Carla of Filmigeek watched in tandem. It's a 70's flick that depicts Shabana and Vinod as a married couple whose marriage gets tested by her suspicions that he's a murderer. Sadly it's not a good film - or rather, it would be okay, if it didn't take such a nose dive towards the end. There's also Lahu Rang .. something something. I've seen screencaps of that but haven't watched it. I think the jodi is best in Desai films which is sad because these two could've been so good in a more artsy film. Erin Georgia - First, welcome. :) Second, it was instant love for me and Parvarish and while I can't understand why somebody wouldn't like, I have my own Vinod fangirl/Neetu-loving/Manmohan Desai-worshipping biases that play into my love for the film. Filmi Girl - I'll also be dropping references to other films but even looking at pictures will give you a good idea of the film. I think you'd really like it! Bollyviewer - Oh it's so worth a rewatch. I actually think it has better pace than the more popular Amar Akbar Anthony (though I naturally adore that one, too).